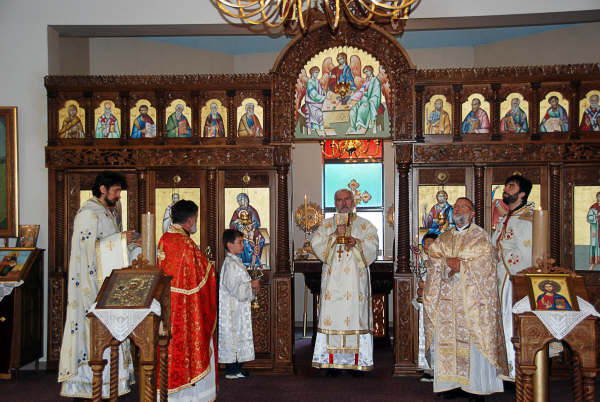 Waterloo, Ontario – On the feastday of the Nativity of St. John the Baptist His Grace Bishop Georgije of Canada officiated at the Holy Hierarchical Divine Liturgy at St. George Serbian Orthodox Church in Waterloo, assisted by diocesan clergy, V. Rev. Stavrophor Vasilije Tomic from Toronto, V. Rev. Stavrophor Vasa Pejovic and Rev. Milan Jovanovic from Kichener and the local clergy Rev. Goran Gojkovic. This was the bishop's first, historic visit to this St. George parish in the now unified diocese under one omophorion. After the service the bishop addressed the faithful with words of thanksgiving to God that the final unity, not only a formal-administrative one, but the spiritual unity of all faithful Serbs in Canada has been achieved. This unification, stressed the bishop, represents a reflection of the very unified make up of the Church, as One, Holy and Catholic which is a Church through precisely such a spiritual-liturgical unity. The bishop did not conceal his excitement and spiritual joy which was also seen on the faces of all those in attendance who came in large numbers to welcome, listen and receive the blessing from their bishop. A luncheon followed the Divine Liturgy during which the bishop once again stressed the significance and the spiritual greatness of this unification, wishing all those in attendance every blessing from the Lord so that for many years they might gather together with their bishop and the liturgical gatherings. Fr. Goran stressed that the Church is center around the bishop and that without the bishop, as an icon of Christ, there is no Church. He thanked the bishop for his visit and wished that he might visit with more frequency to his own people as their guest but also and above all as the Host in his parish of St. George the Great Martyr.